Since listening to the special John Gruber / Merlin Mann episode of The Talk Show last week, I've kinda been nerding out on Disney stuff. Their discussion about The Magic Kingdom completely reignited my fascination with theme parks, rollercoasters and Imagineering. At its best, Disney's attention to detail goes unrivaled - did you know that the reason you'll never see a pirate in Frontierland is because everything is built on top of an entire network of corridors, allowing staff behind-the-scenes access to every part of the park? Did you know they foreshorten Main St USA both vertically (to make the buildings seem taller), diagonally (to make each side of the street lean in and 'frame' the castle in your vision) and horizontally (to make the street feel longer as you enter the park and longer as you leave). The lengths they go to for effect are nothing short of incredible. My heart, though, belongs to one attraction in particular. 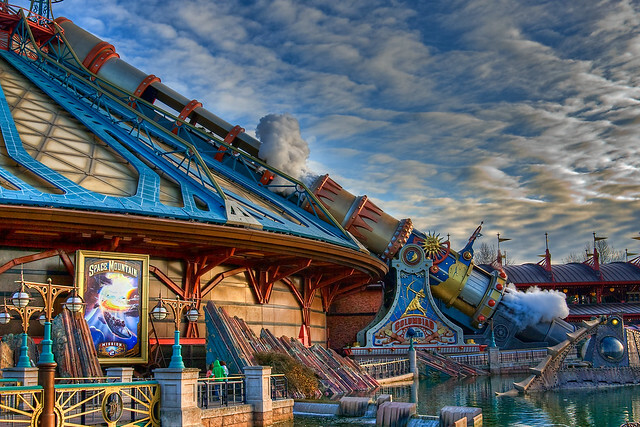 Space Mountain at Disneyland Paris. The ride that some argue saved the park after its lackluster early years. That ride (it's important to distinguish the European version of the ride - the older US versions are far less ambitious) became a passion and a hobby of mine after my parents took my cousin Lynne and I to Disney when I was maybe 11 or 12. The atmosphere, the design, the bloomin' big cannon on the side flipped me out bigtime. Before then, I was already obsessed with rollercoasters. I'd draw them, dream about them, pretend I was on them when riding my bike. I used to record every glimpse of them on the telly, from lame segments on daytime shows ('there's a new ride at Alton Towers, let's see if Eamonn can handle it') to a couple of full-blown documentaries about rollercoaster fan-clubs that I would watch almost daily. Every night, I'd patiently recreate Nemesis or The Pepsi Max Big One on Rollercoaster Tycoon, tinkering away in the way only geeky young boys can. To this day I can't quite explain why I was so consumed. Space Mountain, though, was the best of the best. I knew this. I knew it wasn't the most enjoyable ride (older, wooden coasters are the most fun), I knew it wasn't the scariest (at the time, the Dragon Khan in PortAventura boasted the most inversions and the most intimidating silhouette) but, despite this, I knew it was built with pure imagination and love. I knew not one inch of its design, its accompanying artwork or its operation hadn't been poured over by The Best People In The World. The reason I knew was because I had seen Shoot For The Moon (above), a BBC film that followed the construction and opening of the ride. It was the centre of my obsession. To this day I still know it by heart. A wonderful documentary that mixed really geeky engineering and design stuff with beautiful archive footage and a ton of interviews. Through Shoot For The Moon I was introduced to Jules Verne, Le Voyage Dans La Lune and retro-futurism. I learned about the Space Race, the power of art direction and, most importantly, that behind every great, fun, exciting thing there's someone (an adult - who've thought?) who's job it is simply to make their imagination reality. I guess I could cite Space Mountain as being a major influence on my 'career', as weird as that may sound. I didn't know it at the time, but by watching that film over and over I was immersing myself in ideas, illustration and design. Seeing the man behind the curtain revealed made things more magical, not less. Biology doesn't ruin the 'mystery' of nature. Astronomy doesn't ruin the 'wonder' of the universe. Shoot For The Moon is available on YouTube (in 5 parts) and I can't recommend it highly enough. Nostalgia is no doubt clouding my judgement, but trust me, give it a watch. If you're in any way involved in a creative profession, you'll find something of interest. It's great. You might even get a little hint of the Disney magic that's so easily forgotten once you've grown old and cynical.